Outsider and contemporary art collectors and enthusiasts won’t want to miss the upcoming show at The Judy A. Saslow Gallery -- Far Out: 2012 -- opening 5 p.m. to 8 p.m., January 6, Judy A. Saslow Gallery Presents Far Out 2012 and running through February 18. This exhibition features artists from all over the world with a special addition of 40-some pieces from Saslow’s highly regarded personal collection. "This is a rare opportunity for many collectors. I’ve been collecting for a long time; unfortunately, I’m moving my home and the new space has more windows than wall space so I’m making some cherished pieces available," said Saslow. 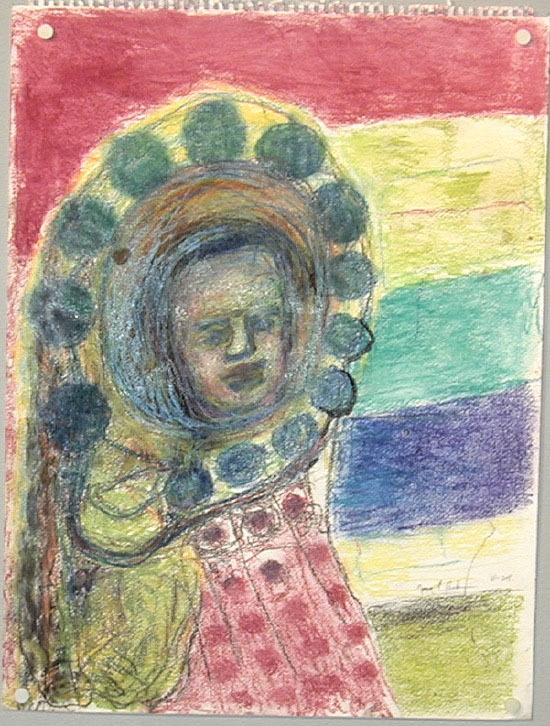 A longtime collector of outsider art and pieces by self-taught artists, this is a rare opportunity to view and purchase some unique and coveted pieces from her carefully cultivated personal collection. By presenting this exhibit the gallery’s aim is to expose their viewers to the multifaceted and talented array of both outsider and contemporary artists the gallery represents. Artists being shown include: Bill Traylor, Henry Darger, Tony Fitzpatrick, David Lee Csicsko, Michael Noland, Lee Godie, François Burland, Ed Paschke, Nancy Paschke, Matt Lamb, Michel Nedjar, Purvis Young, Clyde Angel, Edmond Engel, Gérard Cambon, Christine Sefolosha, Valerie Potter, Marco Raugei, Charles Steffen, Jaber, Stanislav Holas, Giordano Gelli, Ed Beebe, Oscar Haus, Guido Boni, Johann Fischer, Franz Kamlander, Franz Kernbeis, Johann Garber, Umberto Ammannati, Jean Crawford Adams, Damian LeBas, Jacob Manguno, Vittorio Carlesi, Angela Fidilio, Claudio Monsignori, Montet, Attilio Scarpa, Claudio Ulivieri, Nancy Josephson, Andrew Hall, Winnifred Birts, and Kenneth Williams. Judy Saslow has been passionate about art since she was a child taking classes at the Art Institute of Chicago. She is a respected art collector throughout the art world. Her intent for her gallery is to be unintimidating and homelike—a place where people can feel free to linger, to learn more about the art while envisioning how each piece might fit into their own personal collections. The Judy A. Saslow Gallery is open from 11 a.m. to 6 p.m. Tuesday through Friday and from 11 a.m. to 5 p.m. on Saturdays. It is located at 300 W. Superior St., Ste. 103 in Chicago. 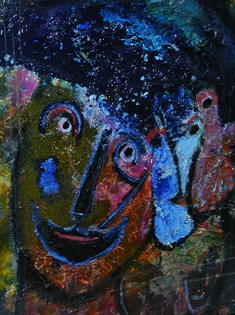 For more information about Judy Saslow and her gallery, please visit http://jsaslowgallery.com/ or call 312-943-0530. Clyde Angel (1920-2006), born Vernon Clyde Willits, was a welder in Clinton, Iowa, for 40 years. A World War II veteran, he was a self-taught artist who found art as an outlet for his free time. 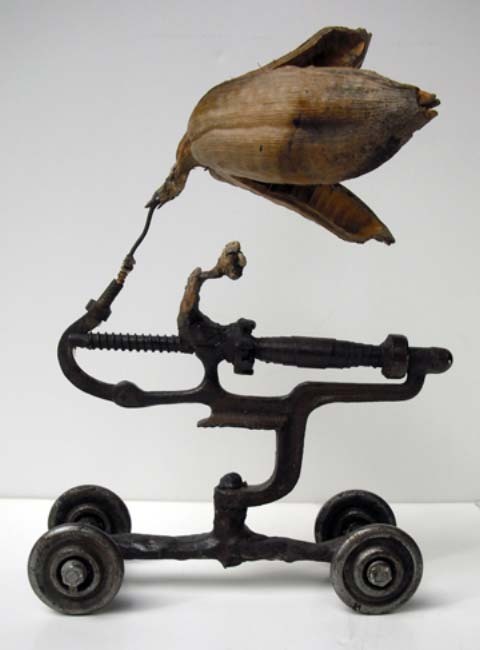 After his retirement in the early 1990’s, Angel began to make powerful works from found objects. He used drawings, writings, wall reliefs and sculpture objects to reference his past, present and future. He was very hesitant to have his face attached to his work in his lifetime, which made things difficult for his admirers and those who represented him in his lifetime. "If you want to know me, know me by my art", he would say. Winnifred Birts mostly uses markers and paint pens on a variety of surfaces. Most of her work focuses on scenes that express the contemporary African-American urban experience and captures the essence of Chicago neighborhood life. Winnifred Birts is sponsored by the Nathan and Kiyoko Lerner Foundation, an art program for artists with disabilities from all over Chicago. Francois Burland (b. 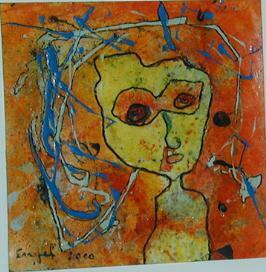 1958), a Switzerland native began painting after entering psychotherapy as a young adult. Burland is inspired by mythological legends, rituals, mysticism and the ancient world. His work is instinctive, spontaneous and reminiscent of archaic nomadic expression. His work is showcased all over the world in places like the Museum de Stadshof, the Musee de L’art Brut, the Du Mong Kunsthalle, the Rosa Eastmann Gallery and the Los Angeles County Museum. Gerard Cambon (b.1960) is a self-taught artist living and working in Paris creating art work composed primarily of found materials. He started collecting and using found materials in his work in 1992. He started creating "locomobiles" and bas-reliefs and presented them at La June Peinture, a Parisian art fair. He has described his process as peaceful and private. He only begins to introduce the figure once the private worlds have been created. David Lee Csicsko is a Chicago artist who brings out things other eyes may not see with his art. An Indiana native, David was influenced by the art of a local church which celebrated the art of labor. He is marked by a strong work ethic and a refusal to judge people. The stories of outsiders come through honestly in his work. Edmond Engel (b. 1937) grew up in Switzerland where he began teaching himself how to draw after his mother’s death. He is now a prolific and passionate artist. Aside from his drawings, Engel has also published poetry. 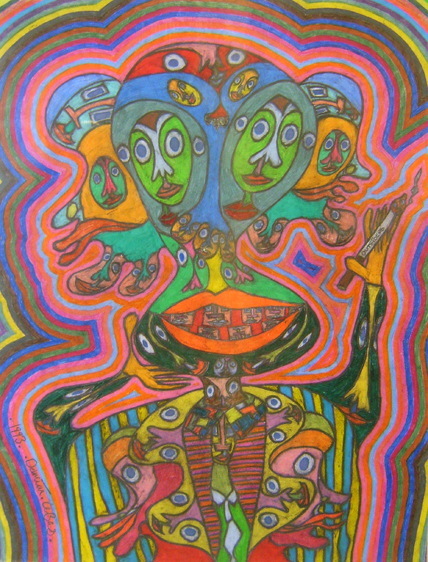 His work has been displayed internationally, including at Baltimore's American Visionary Art Museum and Jean Dubuffet's Collection de l'Art Brut in Lausanne. Johann Fischer (b. 1919) is from Austria, where he worked as a baker and a member of the military. He later suffered from hallucinations and was hospitalized. He joined the Gugging house of artists in 1981, where he was inspired to draw. Most of his work includes his own text and tells stories of farming, life, politics and winemaking. 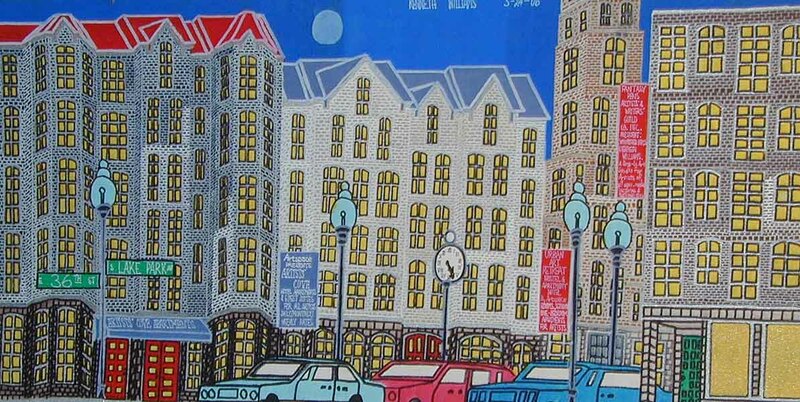 His work has been displayed at the Museum of American Folk Art and the Chicago Cultural Center. Tony Fitzpatrick (b. 1958) began drawing with pastels in a storefront in Villa Park, Illinois. 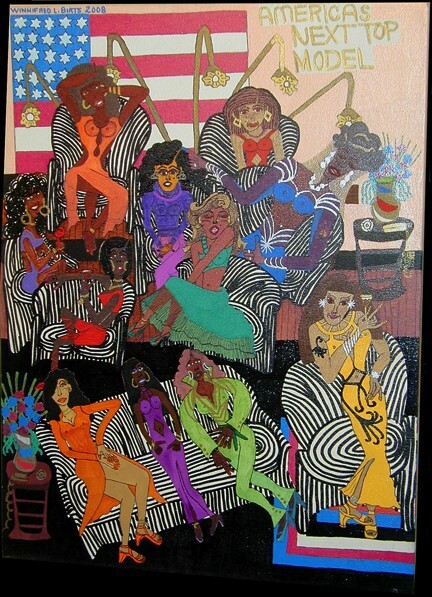 He began putting on gallery shows in the late 1980s in Chicago and New York, which led him to be a successful artist. Tony is also a published poet. Tony gets inspiration for his work from the city of Chicago, especially the underbelly of society and the Chicago White Sox. 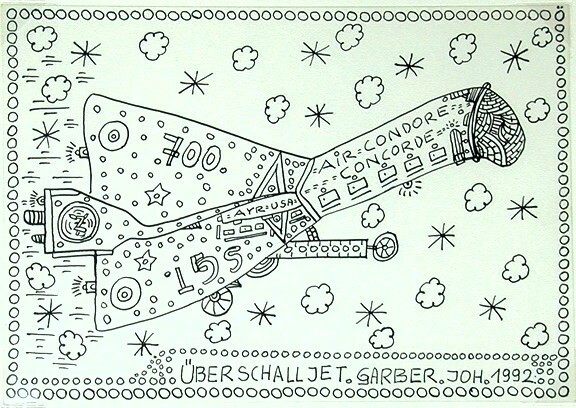 Johann Garber (b. 1947) has lived in the Gugging House of Artists since 1981 and has been creating art since the late 1970s. His characteristic technique is fine line drawing in black ink on paper, showing fine details. He takes inspiration from old calendars, photos and ornamental figures. 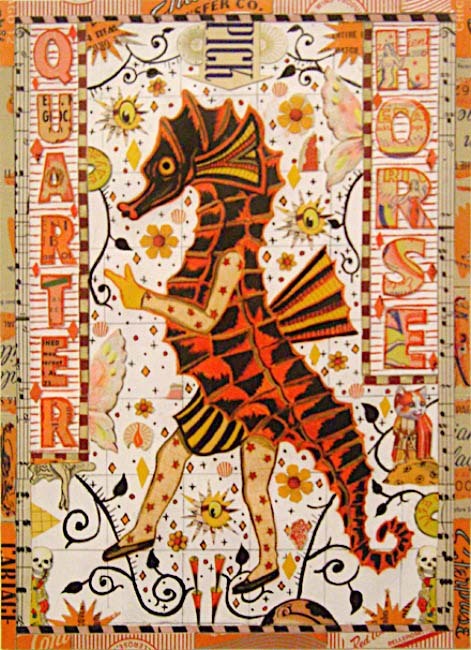 He also produces colorful, flatly painted pictures and has created pieces on found objects. Giordano Gelli (b. 1928) began his life as a weaver in a textiles plant during World War II. The plant was often bombed during the war, leaving Gelli severely wounded and igniting mental illness. After he was hospitalized, he filled his time by attending workshops at "La Tinaia," where he began to develop a distinct style and his own body of work. 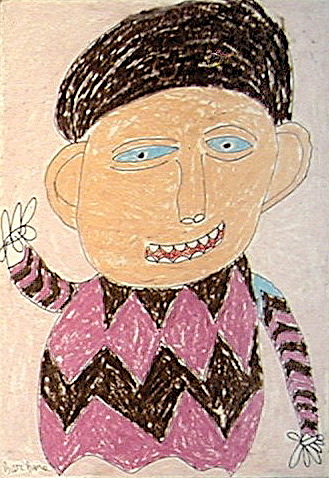 His work is a part of many important collections, including Dubuffet's Collection de l'Art Brut in Switzerland. Lee Godie (1908-1995) lived on the streets of Chicago by choice, considering herself to be a great French Impressionist. She sold her paintings on the steps of the Art Institute of Chicago. Godie painted on found objects like paper and discarded window shades. She has become an icon in the Chicago art world after multiple gallery exhibitions, museum shows and thousands of paintings. 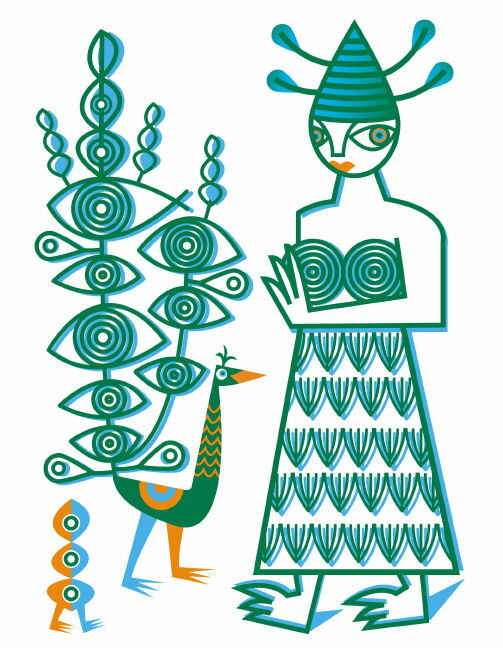 Stanislav Holas (1905-1989) was born in Southern Moravia. He started drawing as a youth, but became more active after his retirement from police work and the death of his wife. He started showing his work in 1937. 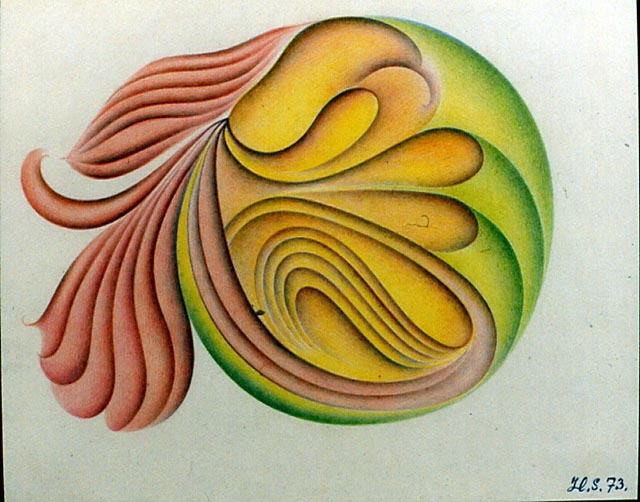 His early works are more figure-based, but as his work progressed it became more abstract with rounded shapes and finely modulated warm colors or shading. 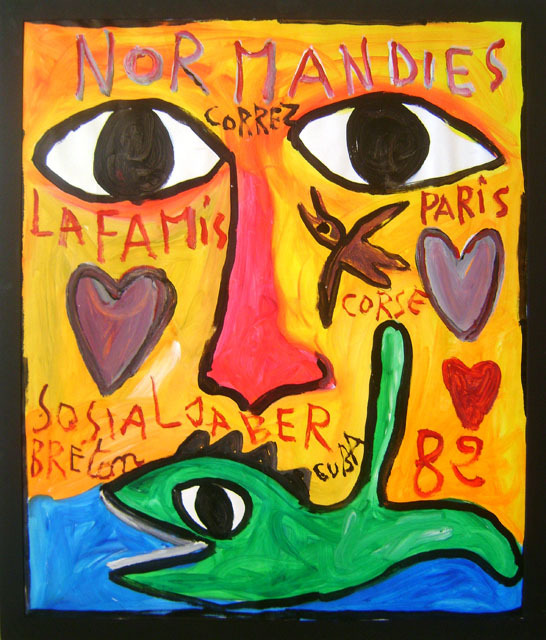 His work is currently part of the exhibition L’Art Brut Tchéque in Paris. Jaber (b. 1938), originally from Tunisia, started artistic work drawing with charcoal on the walls of the bakery where he worked as a teenager. After he moved to France in the 1950’s, he became a street actor and singer. After his first Parisian art exhibition, he married an American girl and won his first art award. His work is recognized able by its bright colors and vigorous energy. He has been painting and exhibiting his work worldwide for twenty years. Matt Lamb (b. 1932), a Chicago native, began his career overseeing a chain of funeral homes. After he survived a life threatening illness, he devoted his life to creating art. A self-taught artist, his work is a reflection of his own philosophies and religious beliefs. He calls his painting technique generational, where multiple paintings are layered on the same canvas, giving his work its unique look. Matt Lamb has exhibited his work throughout the world, from the Vatican to the Mall of America. Damian Le Bas (b. 1963) had an emotionally troubled childhood in England, and he found refuge in his imagination. His work began by drawing crowds at soccer matches. While a friend encouraged him to attend art school, this did not last very long as he was not interested in performing assignments. He began exhibiting his work in the Outsider Archives in London. Le Bas does not plan out his work, but starts with a little face and an eye and lets it grow from there. His work generally uses bright primary colors to convey his sense of design. Michel Nedjar (b. 1947) is a Parisian native who grew up as the son of a tailor. His father’s business taught him how to make dolls out of cast-off fabrics and tree roots. After traveling in the 1970s, he became fascinated by dolls sold in marketplaces around the world. 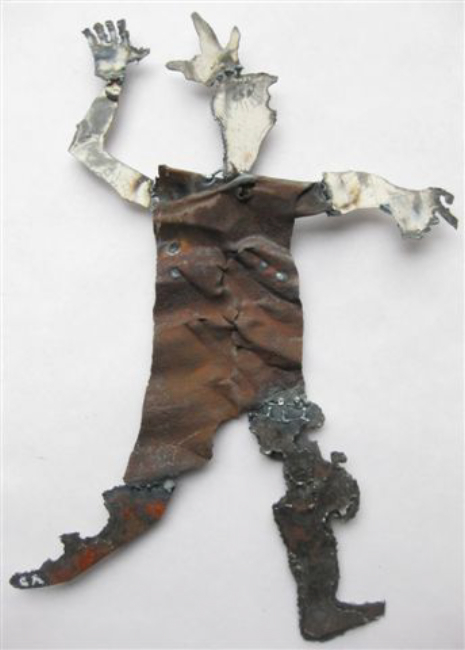 He began making his own dolls out of found objects and began drawing. His dolls are a permanent part of the Collection d’Art Brut in Switzerland. 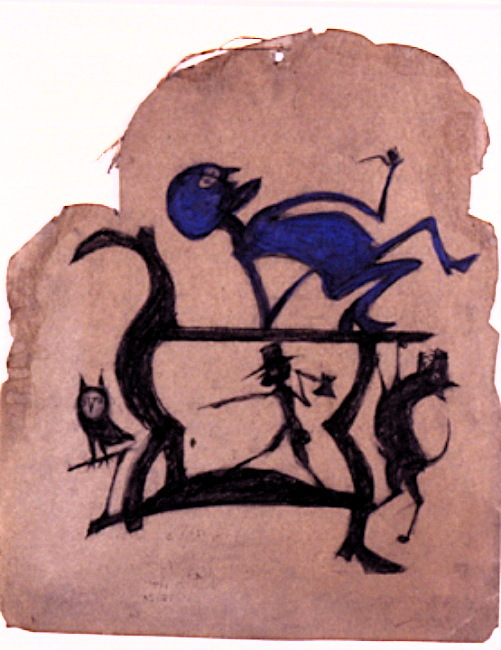 Nedjar is a co-founder of the L’Aracine Collection of Art Brut. 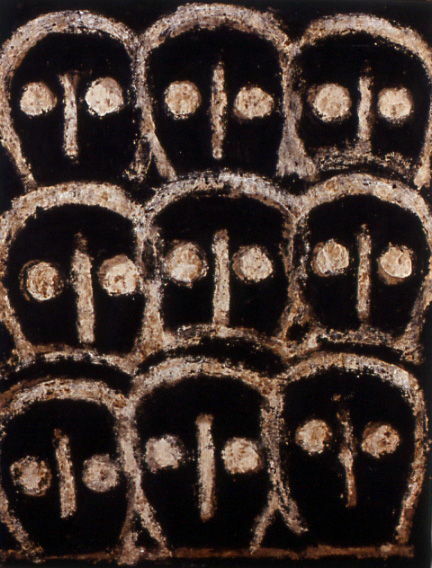 His work often features animal and bird figures and the human face in an owl-like mask. His mature work embodies dignity and authority and is often compared to ancient religious art. Nancy Paschke (1939-2005) is an Illinois native who met and married Ed Paschke while they were both students at the Art Institute of Chicago in the late 1950's. 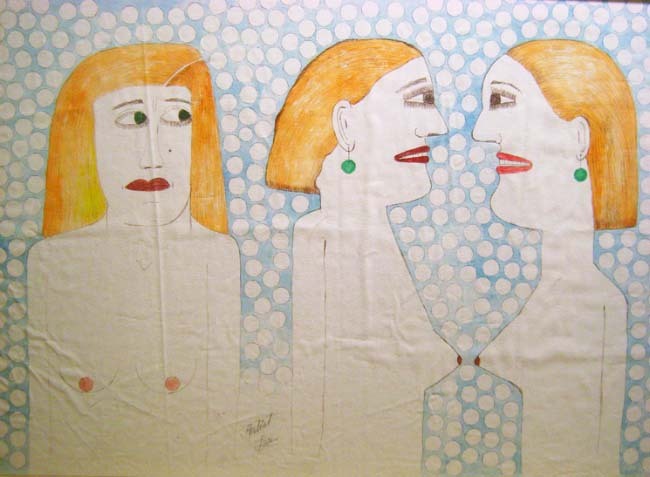 In 1972, she developed Parkinson’s disease, but this did not stop her from creating art. The last three years of her life were extremely prolific. Most of her subject matter is still life and portraiture, objects in her room and images from magazines and her imagination. Style variations in her work are the effects of Parkinson’s disease. Marco Raugei (1958-2006) was born in Florence, Italy, and was diagnosed with schizophrenia as a child. In 1986, he began attending La Tinaia, an artists workshop, to develop his drawing skills. 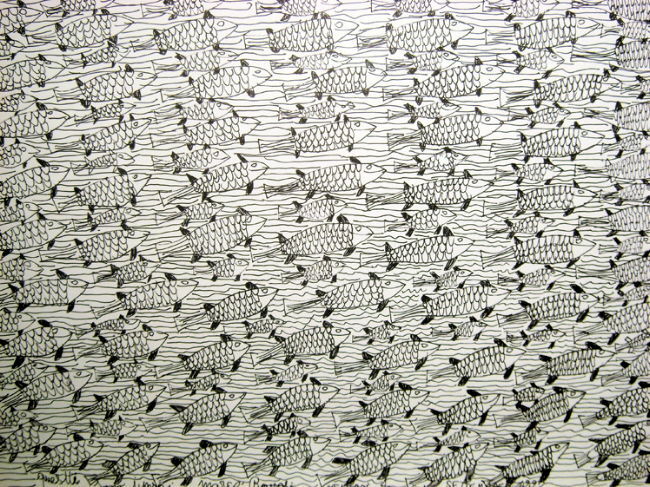 Around 1988, he discovered the idea of repetition in his work. Raugei draws a single image and then repeats it in horizontal rows until the page is full. He works from the bottom left corner to the top. 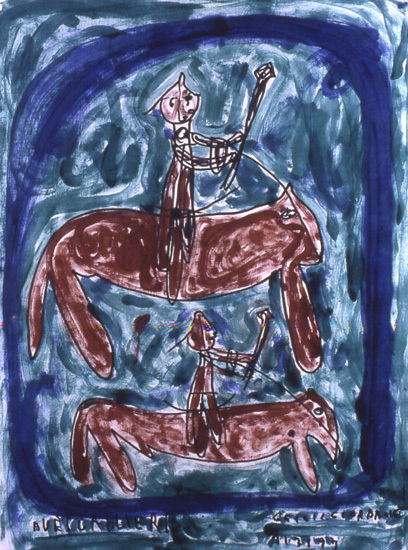 His work has been displayed in the traveling exhibition “ABCD: a Collection of Art Brut” at the Museum of American Folk Art and at the Chicago Cultural Center. Attilio Scarpa was born in Marradi (Florence). In 1989, he began working in the farming community of San Salvi Psychiatric Hospital. As the farming project drew to completion, he joined La Tinaia in hopes of furthering his creative output. After growing comfortable in his surroundings, Scarpa began roaming the halls, copying the posters on the walls, and sketching the other patients. Today, Scarpa has ventured away from La Tinaia and has taken a break from painting. Christine Sefolosha (b. 1955) is originally from Montreaux, France, but moved to South Africa after marrying a white South African. She began drawing and painting there and began to move among the black South Africans. She divorced her husband to marry a black musician, but was forced out of the country by apartheid. After returning to France, she began creating art again, inspired by her time in Africa. Sefolosha mixes her paints with dirt and tar, creating a mix of sophistication and crudity. Most of her figures are wild animals. More recently, she has begun applying watercolors to Japanese paper, creating a different style. 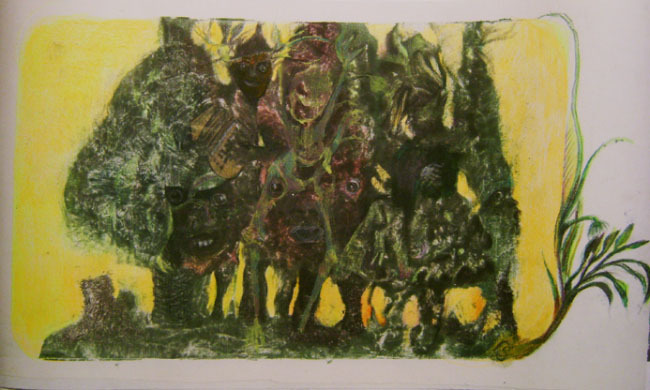 Her work is a part of many public and private collections, include the Collection de L’Art Brut and the Musée de Cite de Creation. Bill Traylor (1854-1949) was born a slave on a plantation in Alabama, where he stayed through emancipation in the mid-1930s. 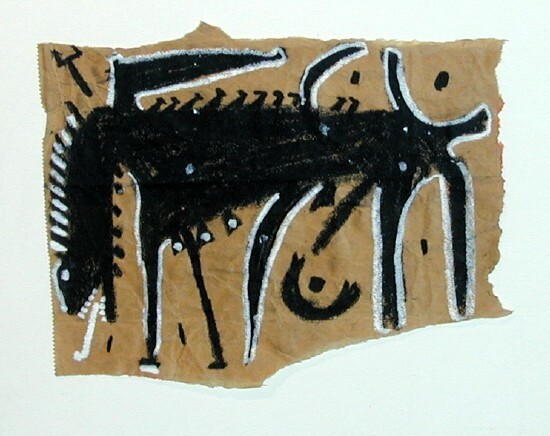 In 1939, he moved into Montgomery and began drawing on scraps of cardboard and met some young white artists who offered him materials and financial support. His first exhibition took place in 1940. A year later, he had an exhibition at the Fieldston School in New York City. An exhibition in 1982 at the Corcoran Museum brought him to the attention of a wide audience, and a story about his life, "He Lost 10,000 Years," was published in Collier's magazine. Kenneth Williams is in his late twenties or early thirties, and is a lifelong Chicago resident. Using only colorful magic-markers with no preparatory drawing, the artist will look at an existing vacant lot and draw it as he envisions its development with various chain stores and their signage. Each street corner identified in his pictures is a real Chicago location. Kenneth Williams has been making these drawings for as long as anyone can remember and hopes to have a long career. The New Year is just around the corner, and everyone is trying to use the same old methods to improve themselves: a new diet, joining a gym, a different exercise plans. But sometimes these things just don’t work. If you’re looking to try a brand new method to get yourself healthy this year, Urban Acupuncture has something new for you to try. Kyla Boles of Urban Acupuncture is setting out to help you do just that. By focusing on getting healthy from the inside out, her 21-Day Purification Program is designed to help you look and feel your best. From environmental pollutants to processed foods, we are exposed to a staggering number of harmful toxins that can greatly disrupt the body’s endocrine, immune, nervous and reproductive systems on a daily basis. While the human body can rid itself of some toxins naturally, eventually the burden becomes too much. This is where Urban Acupuncture’s 21-day purification program comes in. This program is designed to help the body get rid of toxins to maintain health. Developed by whole food supplement manufacturer Standard Process, Inc., the program uses whole, organic and unprocessed foods with whole food supplements to help cleanse the body. The purification program takes place at her Urban Acupuncture studio (3166 N. Lincoln Ave. Suite 405, Chicago, IL 60657; 773-727-5042) and is designed to help the body process toxins, improve digestion and maintain a healthy weight. Although the program has not yet been evaluated by the Food and Drug Administration and is not intended to diagnose, treat, cure or prevent any disease, clients have found the process to be very effective. “Kyla is amazing. She has helped me with manage back pain, anxiety and weight loss. She is very supportive and encouraging. I recently completed a detox cleanse with her assistance, and I have lost 22 lbs. 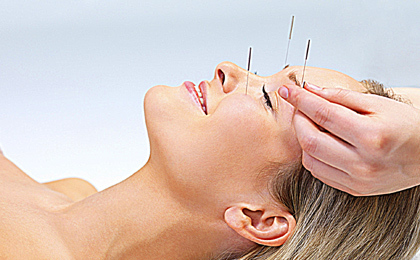 and feel better than I have in a very long time!” says one of her clients. There isn’t a better way to start the year than by feeling great, and during December and January the 21-Day Purification Program is $50 off! For additional information about Kyla Boles and Urban Acupuncture, visit www.urbanacupuncturechicago.com. Head on over to Mia Francesa’s (3311 North Clark, Chicago, 773-281-3310) to enjoy their fabulous new brunch Saturday and Sunday, 10 a.m. to 3 p.m. Don’t miss trying our favorites, Pollo e Uovo (Crispy chicken and bacon hash with two eggs any style) $10.99; Melanzane Parmigiano (Eggplant parmesan benedict with hollandaise) $9.99 and the to die for Pancakes al Ricotta (Mocha ricotta pancakes, cinnamon whipped cream, drizzled with honey) $8.99. 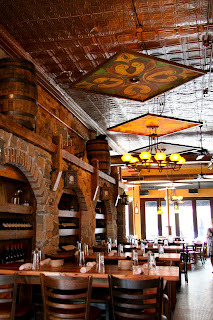 They have a lovely a la carte brunch menu and special selections from the popular Mia Francesca dinner menu. Bon appetit! 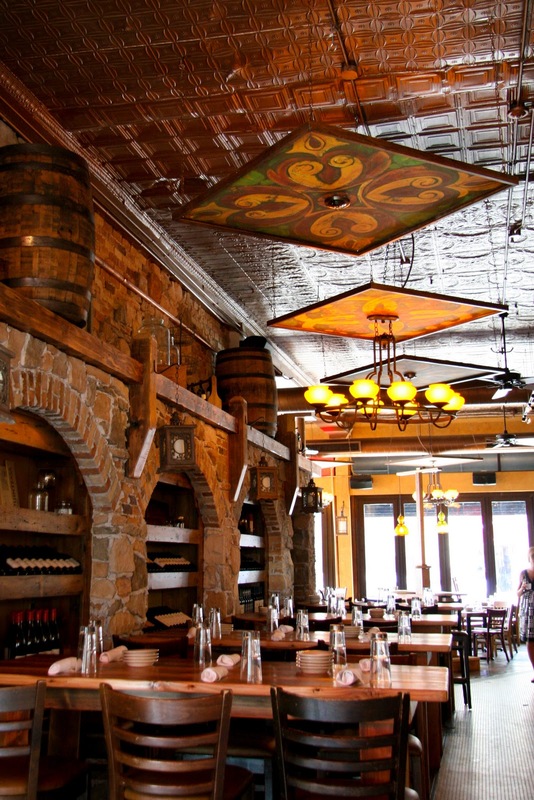 Wicker Park’s hot spot Francesca’s Forno (1576 N Milwaukee Ave., 773-770-0184) popular for its small plates traditional Italian with a contemporary twist, is now open for lunch 11 a.m. – 4 p.m. Monday-Friday and brunch , 10 am – 3 p.m., Saturday and Sunday. 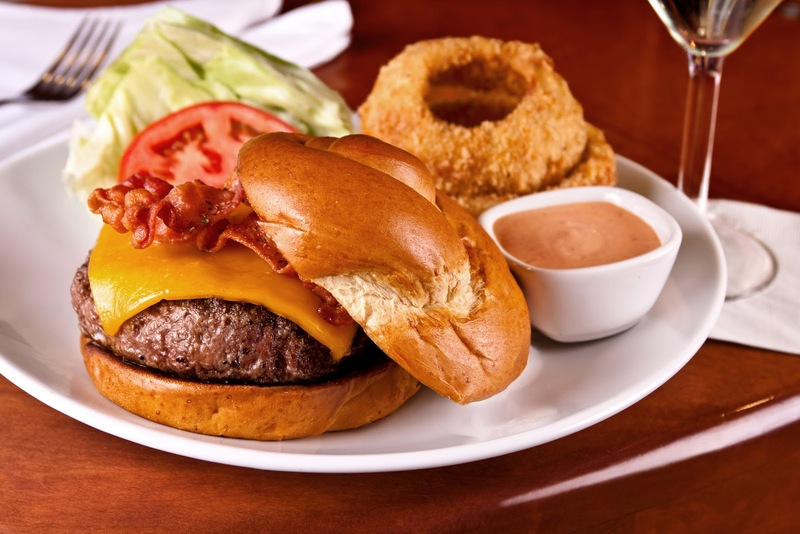 They also boast a terrific late night menu available 11 p.m. to 1 a.m. every Thursday, Friday, and Saturday. Our hot picks on the Forno brunch menu include the Bourbon-Soaked French Toast (Challah with bourbon vanilla bean batter, maple crème fraiche and candied pecans) $9, Savory Pancakes (Polenta, bacon, sweet corn pancakes with maple butter) $9, and the Breakfast Monte Cristo (English muffin, Fontina, crispy pancetta, fried egg with spicy tomato jam and hash browns) $10. Of course, you can build your own omelet, $12 and enjoy a fabulous Forno Bloody Mary (Vodka, spicy tomato juice, shot of beer) $6. Did you know that one of the Food Network’s newest stars is from right here in Chicago? Jeff Mauro, also known as the Sandwich King, stopped by his hometown and the Chicago French Market to film for the second season of his show. Kurman staff was lucky enough to be able to be in on some of the taping. Mauro and his crew stopped by Freitkoten for Belgian fries and beer, City Fresh Market to take in some great sandwich ingredients and Saigon Sisters for their twist on the hot dog. And this isn’t even the main event! The crew is stopping by again in the next month to film some of the French Market’s greatest sandwich offerings to feature on the show. The Kurman staff attending the shoot had a great time, and we can’t wait to see the Sandwich King and crew back at the French Market! 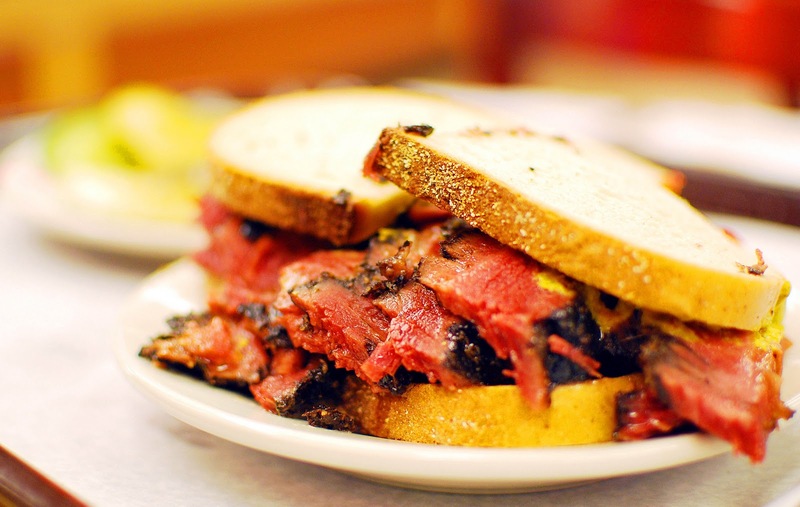 If you’re looking for a great sandwich at the Market to tide you over until this episode of Sandwich King airs, check out the amazing pastrami sandwich from Fumare! 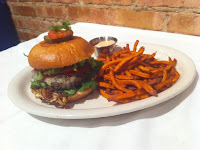 This sandwich has gotten great reviews recently from TimeOut Chicago, Serious Eats and food personality Steve Dolinsky. But make sure to stop by early…these sandwiches don’t last all day! Enjoy exquisite Italian cuisine every Friday night at Maxwell's at the Club (East Bank Club, 500 N. Kinsbury, 312-547-5800). Choose your favorites from an extensive buffet of antipasto, salads and entrées. Build your own blend of pasta, sauce and add-on ingredients. End with a dessert from a special menu, $28 per person; $12 children 10 and under. For reservations, call (312) 527-5800, extension 301. Worried about teaching your kids healthy eating habits? You’re not the only one. Luckily, now Chicago chefs have made parents’ jobs a little easier with the Healthy Fare for Kids initiative, which has launched in Chicago’s 43rd Ward this week. Diane Schmidt, a concerned parent and health educator, was concerned about children’s menus in Chicago restaurants and wanted to do something about it. She spoke to Michelle Smith, Alderman of the 43rd Ward, about an idea to challenge restaurants to provide at least one healthy meal for children on their menu. Smith guided her to Sarah Stegner, Green City Market board member and co-chef and co-owner of Prairie Fire Restaurant and Prairie Grass Cafe. Together with holistic nutrition consultant Carol Wagner, the group came up with a list of guidelines for chefs to follow in creating healthy meals. These guidelines include substituting bread at the table with fresh vegetables, ensuring some lean protein with the meal, serving whole grain breads and pasta, using cooking methods that are lower in fat while still retaining flavors, keeping ingredients local and seasonal, using simple portion sizes and keeping beverages high in sugar off the table. By getting kids to think differently about food when they eat out, parents can help teach their children to make healthy choices that still taste great. The initiative is currently active in the 43rd Ward, but there are plans to take it city-wide early next year and eventually nation-wide. “If you put healthy and delicious food in front of kids, they will eat it!” says Stegner. For now, you can check out Healthy Fare for Kids at one their many participating restaurants. More are being added every day, so be sure to check back on our blog and with your favorite restaurants to see who is participating! 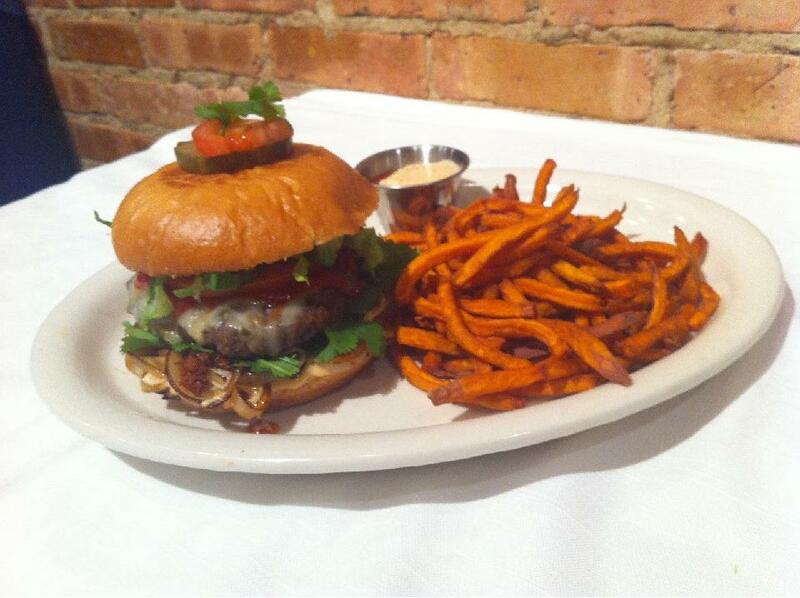 Stanley’s Kitchen & Tap (1970 North Lincoln Avenue Chicago, IL 60614-5404; 312-642-0007). Note: Restaurants and chefs wishing to participate in the program should contact Sarah Stegner at 312-382-8300 or via e-mail at sarah@prairiegrasscafe.com. Feeling uninspired with your holiday plans this year? Let Kurman clients step in to deliver some holiday cheer! From visits with Santa to delectable and exciting New Year's Eve menus, everyone can find something to enjoy. 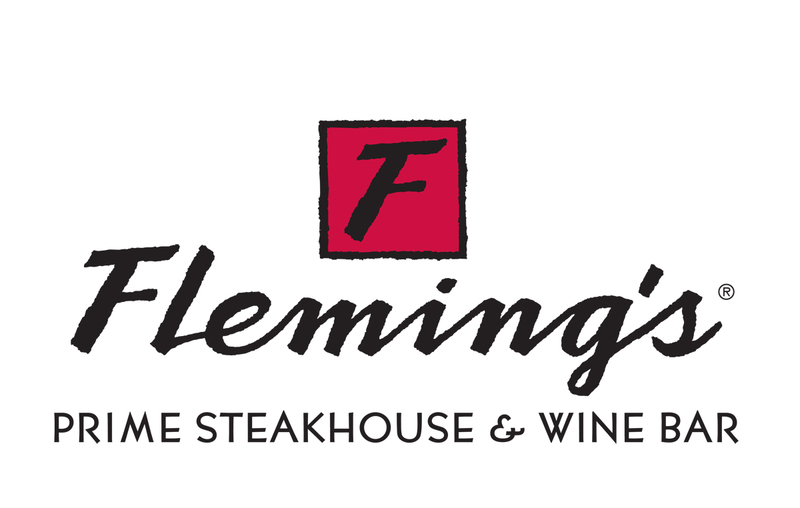 Fleming’s is also offering Moët & Chandon Impérial Champagne (rated 91 pts. in Wine Spectator) by the glass ($20) and by the magnum ($200). Fleming’s champagne cocktail for the evening is the Sparkling Star, developed by wine director Maeve Pesquera. Maeve developed a sparkling wine cocktail that will tickle your nose and put a twinkle in your eye. Since she’s pouring a California sparkler, Chandon étoile Brut, and the word "étoile" is French for "star," she calls the cocktail, Sparkling Star. This cocktail is available for $10.95 a glass. Santa Claus is coming to Francesca’s. Francesca’s Tavola (208 S. Arlington Heights Rd., Arlington Heights, IL 60005; 847-394-3950) hosts a Santa Breakfast Saturday, December 10 from 9 to 11 a.m. There will be arts and crafts projects at the restaurant that morning and a coloring contest while Santa walks through and visits tables. Sunday, December 11th from 4-6 p.m., Santa will visit Francesca’s Fortunato (40 Kansas St., Frankfort, IL 60423; 815-464-1890). Santa will sit on a big chair next to the tree and listen to your kids’ wish list. Then, enjoy a great holiday family meal at Francesca’s. La Sorella di Francesca (18 W. Jefferson Ave., Naperville, IL 60540; 630-961-2706) hosts Santa Sunday, December 18 from 5-7 p.m. Kids will have the opportunity to visit Santa during their dinner. 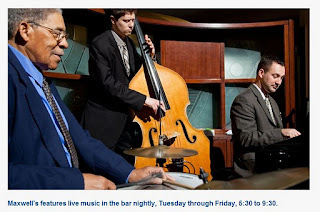 Francesca’s Fiore (7407 W. Madison St., Forest Park, IL 60130; 708-771-3063) features live Christmas carols by Jim Guter's Duo on Wednesday evenings from 6 to 9 p.m. through December 21. Their delightful holiday serenading is a great addition to your dinner! Francesca’s Fortunato (40 Kansas St., Frankfort, IL 60423; 815-464-1890) is participating in Frankfort’s Midnight Madness Friday, December, 16. Local downtown shops will be open late for holiday shopping. After you get something for everyone on your list, come into Francesca’s and enjoy a bottle of wine for 20% off. You can help children in your community have a great Christmas and on your next visit to Francesca’s this holiday season. Francesca’s Campagna (127 W. Main St. West Dundee, IL 60118; 847-844-7099) is spreading good will this holiday season by participating in Toys for Tots. Donate a new toy December 5 through 24 and get a $10 gift certificate redeemable during the month of January 2012. Francesca’s at the Promenade (641 E. Boughton Rd., Bolingbrook, IL 60440; 630-739-6300) is also participating in Toys for Tots this season. When you bring a new, unwrapped toy to the restaurant, the restaurant will give you a free appetizer. All Francesca’s restaurants locations and Davanti Enoteca (1359 W. Taylor St., Chicago, IL 60607; 312-226-5550) will be open on New Year’s Eve. Guanajuato (73 Green Bay Road, Glencoe, IL 60022; 847-205-4433) is offering a family-friendly a la carte menu on New Year’s Eve and is open until midnight. They are also featuring a prickly pear margarita for the holiday. 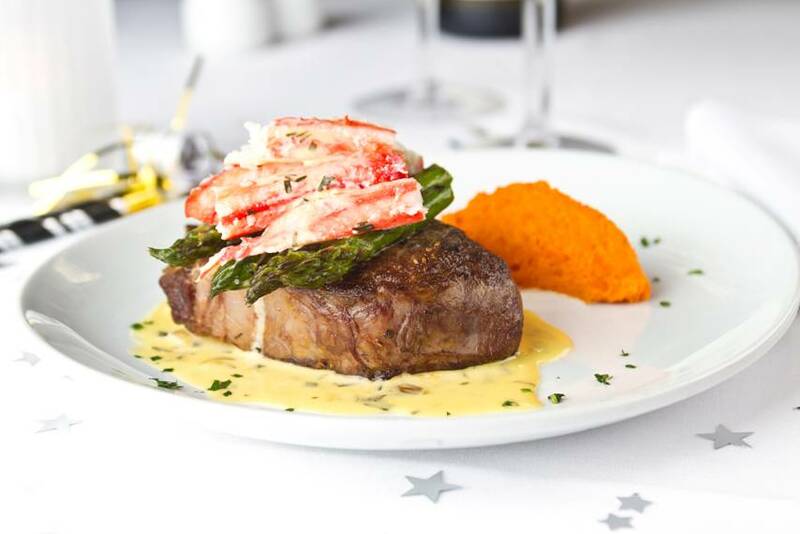 Both Prairie Fire Restaurant (215 N. Clinton, Chicago, IL 60661; 312-382-8300) and Prairie Grass Cafe (601 Skokie Blvd., Northbrook, IL 60062) will both be open on New Year’s Eve with their a la carte menu. Kids are welcome.. New Year's Eve hours are 5 p.m. to 9 p.m.